Published in the South Kent Gazette, 13 May, 1981. When the Emperor of Russia visited this country, after the general Peace of 1814, he passed through Buck-land on his way to London, on which occasion, the pleasing appearance of neatness, comfort and cleanliness presented by the dwellings of these paper-makers, led that monarch to form a very high opinion of the advanced state of civilisation and happiness to which the working classes of England had attained. This mill, on the east side of the Dour, continued to be a paper manufactory until the year 1846, and paper was made there for Indian currency, the water mark being “8 annas.“ The paper mill was last operated by Messrs John and Christopher Phipps. Corn milling, in the meantime, had become a more flourishing industry at Buckland. The supply of the troops, during the war with France, and the victualling of the Navy, carried on from the Maison Dieu, caused all the mills in or near Dover to be worked to their fullest extent; and during this boom in the milling trade Mr William Kingsford bought the Buckland Mill lands, with their powerful water rights, in the year 1814. Leaving the ancient mill, on the east side of the river, to be still used (or paper-making, he built an entirely new corn mill on the west side, with brick in the lower part, and with a timber superstructure, forming the northern part of what became Messrs W. and E. Mannering’s mill. September in that year. The com mill was the principal lot, described as standing five stories high, having five pairs of stones, and an overshot wheel with power derived from nearly 12ft. fall of water. The second lot was the paper mill, which was sold without the water power; and with it was sold the private road over the bridge (which had been built by Mr William Kingsford in 1815), leading to the paper mill, the meadow, and the walled-in garden. That garden and meadow, as well as the paper mill, were also disposed of, at the 1846 sale, and were purchased by Mr John Peirce, of Bartholomew Terrace, Buckland. The paper mill Mr Peirce converted into a brewery, a business which, at that time, was thriving in Dover, and, under the name of the Wellington Brewery, it was successfully carried on by his son-in-law Mr William Harding, as well as by his widow for some time. On the site was a well of good water, having a peculiar iron or chalybeate quality, which probably rendered it valuable for brewing purposes. A considerable portion of the meadow land, adjoining Cherry Tree Avenue, Lorne Road and Alfred Road was disposed of for building purposes in the early 1900s, but a part of Brox-Ditch Meadow, and Dame Albina Page’s walled-in garden, survived for some time as a reminder of the ancient Mill lands of Buckland. Mr William Kingsford had a project for starting a vegetable oil mill at Buckland on the south side of the road below the com mill, and when his property was sold in 1834 the site of that mill and its foundation walls formed one of the lots in the sale. Beside this part of the London Road, business enterprise has wrought great changes. On the west side, in 1829, Mr Flavius Ignatius Kingsford established the Buckland brewery, which ran a successful course, but was later transformed into Mr Palmer’s carriage and motor car repair works, which have changed hands several times during the past 70 years. 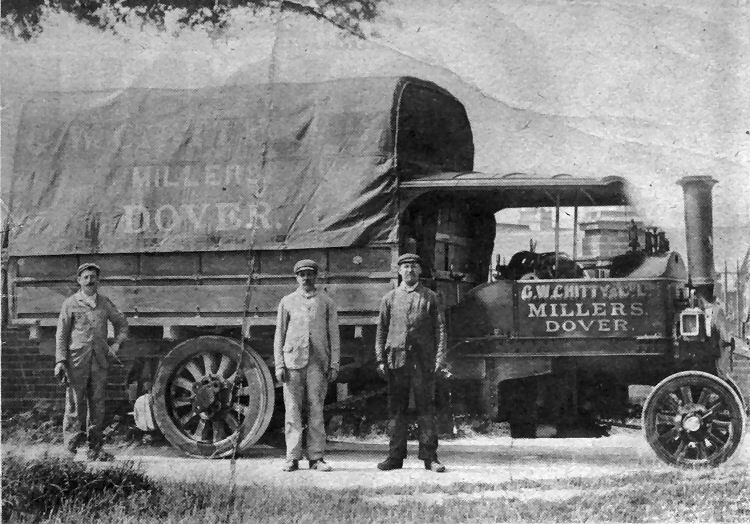 In their heyday Dover's busy mills pressed into service a wide variety of transport to distribute their products. This one is one of G. W. Chitty & Co. Ltd.’s Foden steam wagons which were » familiar sight at the Granville Street mill about 60 years ago. The driver, next to the cab, was Mr Richard Martin, next to him is Mr Fred Payne and near the back of the wagon Captain William Cole, father-in-law of another former Foden driver, Mr Frank Huntley who treasured the original of this picture. The Foden was named little Mary and had a carrying capacity of five tons. Mr Huntley learnt to drive a larger model in 1926 which bad a capacity of six tons, or ten with a trailer.